Last night (Sat., Jan. 19, 2018) from inside the Barclays center Brooklyn Henry Cejudo surprised the MMA world when he dismantled UFC bantamweight champion TJ Dillashaw in just 32 seconds of the first round to retain his flyweight belt. Cejudo dropped Dillashaw to the canvas and then clipped him with a right hand behind the ear. TJ scrambled, and here you go Henry Cejudo unleashed flurries of punches until the referee stepped in to stop the action. Dillashaw says the way Cejudo fight stopped it’s something he’s not happy about it. Bantamweight champion says he’s glad to accept the defeat if it’s legitimate, but according to him, he didn’t lose the fight that’s a bad call from the referee. At UFC on ESPN+1 post-fight presser, Cejudo agreed to run again with Dillashaw at bantamweight in a hope to become a double champ-champ. But it seems like TJ still has some unfinished business at flyweight. Who wants to see Dillashaw vs. Cejudo immediate rematch? 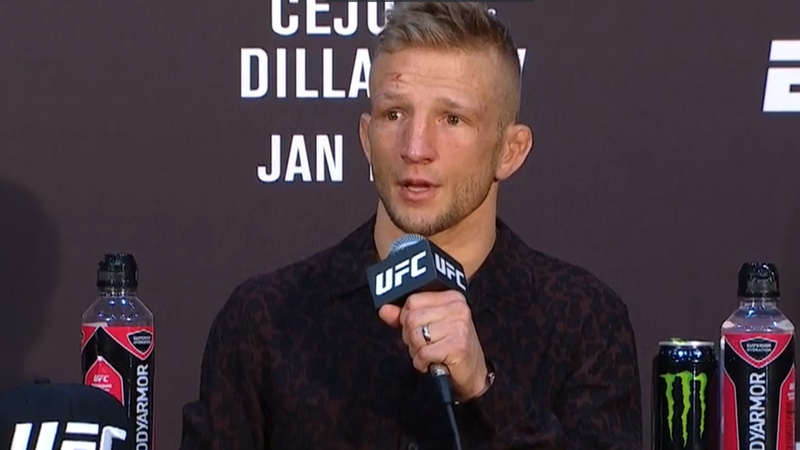 Do you agree with TJ Dillashaw’s comment that the fight stopped too early?